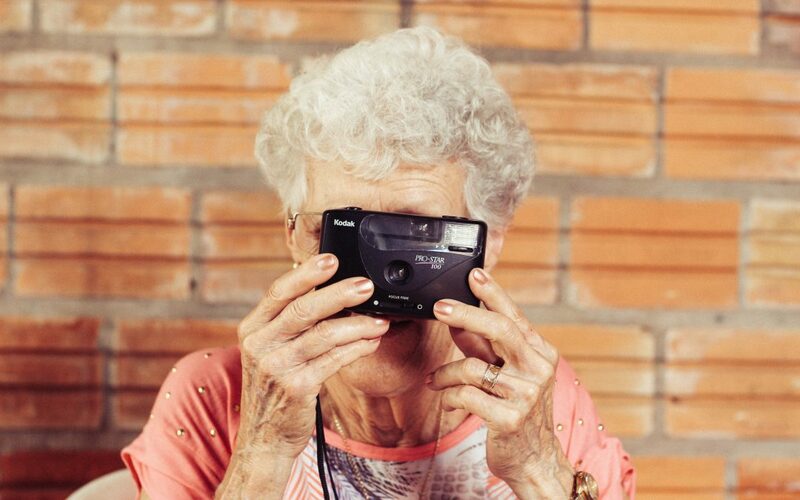 Visa Living is the most equipped senior living home in the Phoenix-Scottsdale region. Each Vista Living home features 10 private bedrooms each with their own private bathroom, a demonstration kitchen with island seating, common areas that encourage lively activity, a patio with BBQ, and landscaped gardens and raised garden beds, for evening walks, family picnics, bird watching for all to enjoy. Can you believe it’s May already? Hope you are enjoying Spring/Summer Time! “Have Fun and Enjoy Life and People will Seek your Company.” That’s a motto we go by. We are appreciative of our special group of residents and the families we serve. 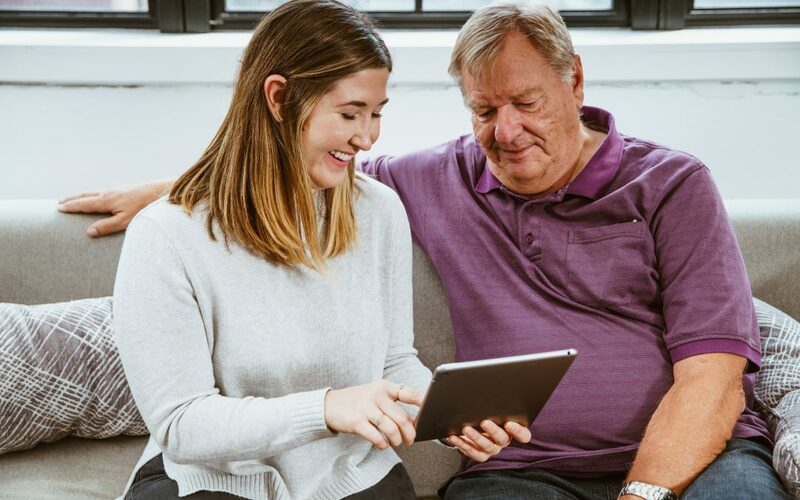 We know that there is nobody who knows your parent quite like you do, and when we hear that we help people be just their son or daughter, rather than the focus on caregiving, that makes us feel like we are adding value to people’s lives and relationships. Being told that “we got their back” and “we can finally sleep at night” helps validate our purpose. The Vista Living team loves it when they see family hanging out with mom and dad. Enjoy each other’s’ time and make memories, that’s the essence of life. We have one suite available at Vista Living Arcadia, and we are now taking reservations for Vista Living Camelback. 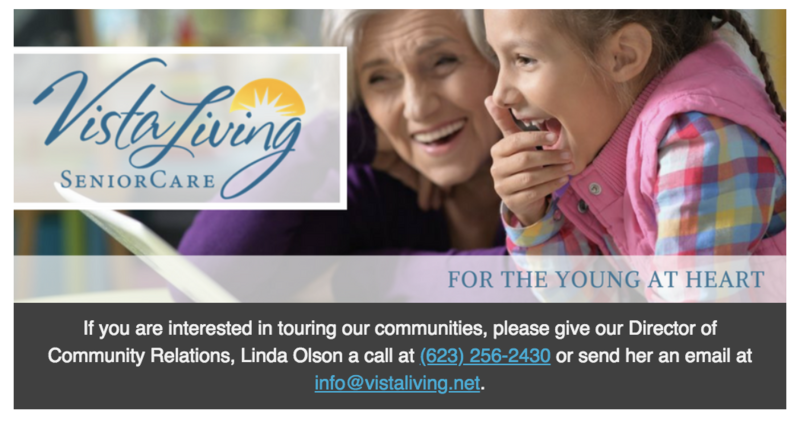 If you are interested in touring our communities, please give us call us at (602) 456-1919 or email us at info@vistaliving.net to schedule a tour. Oldies But Goodies Songs: We have frequent musical performances from Audrey’s Angels playing the hits from the past and some current songs. Bowling & No Troublesome Gutter Balls: Knocking down pins is satisfying but nobody likes getting a gutter ball. The solution is to eliminate the gutter and let folks roll as many times as they need to knock all the pins down. If it’s not fun, don’t do it right? 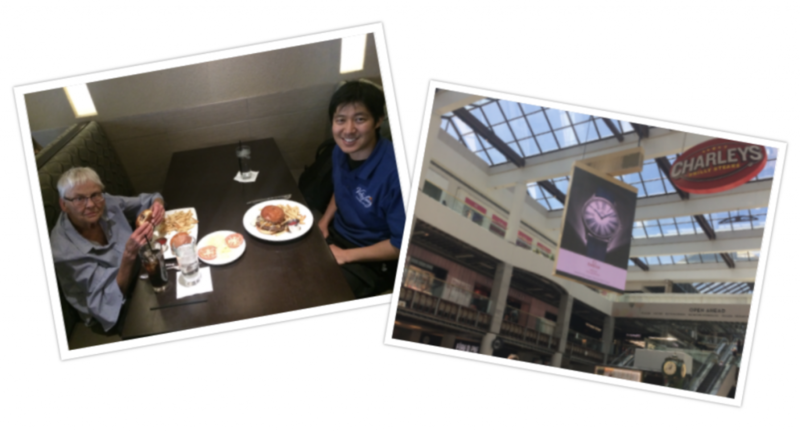 Scottsdale Fashion Square: One of our residents loved to eat burgers and shop so we visited Scottsdale Fashion Square, a mere 6 min drive from Vista Living. Did you know the mall has many options for burgers including, Kona Grill, 5 Guys Burgers, Johnny Rockers, just to name a few? It was funny because our resident loved shoes, so when we walked into Aldo, the customer rep and Kyle looked at each other and knew our gal was in her element. If there was a good deal on a nice pair of shoes, she’d find it. Anyways, fun times. 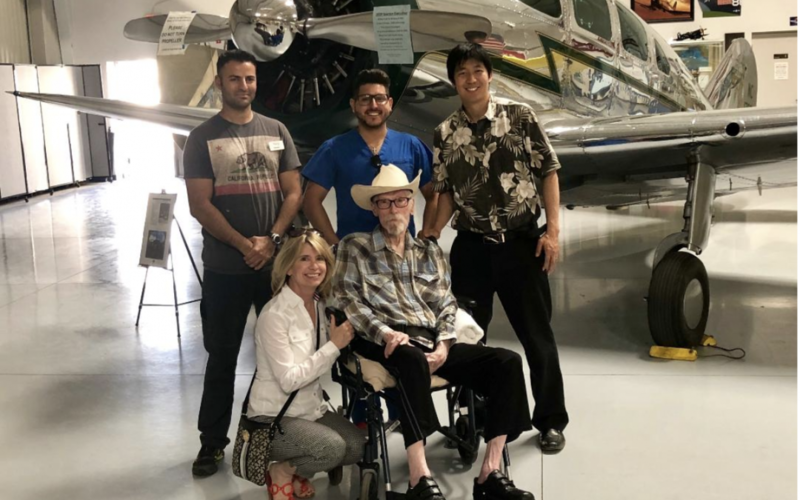 Airplane Museum: One of our residents was a talented commercial pilot and he loved airplanes. Kyle and the resident’s daughter decided, let’s go see some planes. 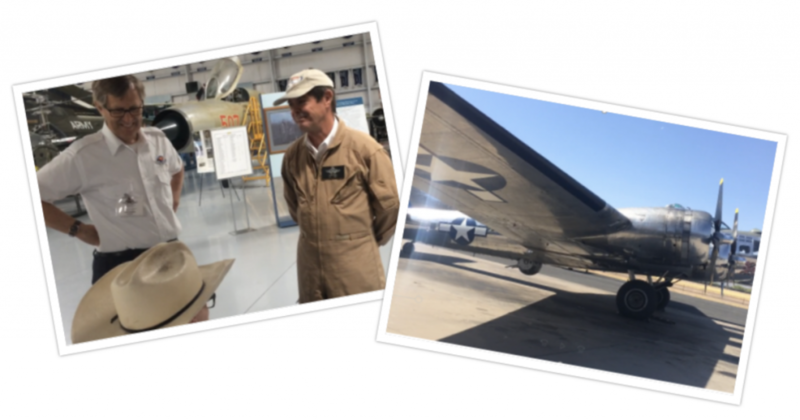 So we went to Mesa to visit the Arizona Commemorative Air Force Museum. Not only did we see operable airplanes that were over 70 years old, but we got to see a historic B-14 bomber take off on the runway. Nothing brightens the face of an aviation enthusiast than talking shop with other pilots. Cool learning experience for everyone, including our staff. Want to have a conversation with someone who knows more than you (i.e. our residents)? Start by asking about famous people with the same last name. So if your name was say Marshall, there’s Garry Marshall (actor), George Marshall (heard of the Marshall Plan? ), and Thurgood Marshall (Supreme Court Justice). Anyways, it was fun exploring these topics and then talking about the past. Special Requests: Kyle video recorded a nice discussion about a resident’s childhood, college years, and mentors. Let’s just say, the family loved having this keepsake. Please let us know if you want us to have Kyle interview your loved one. We have a lot of residents from the surrounding neighborhood. Some of the family members walk to Vista Living to visit. We think it’s a great sign that family is over. This fits nicely with our Happy Elder Plan philosophy of Staying Connected to Community. We want to thank our families for their testimonials. Are you a family member of one of our lovely residents or simply want to let us know how we’re doing? We would greatly appreciate if we can get a review from you. Please email your review to info@vistaliving.net. 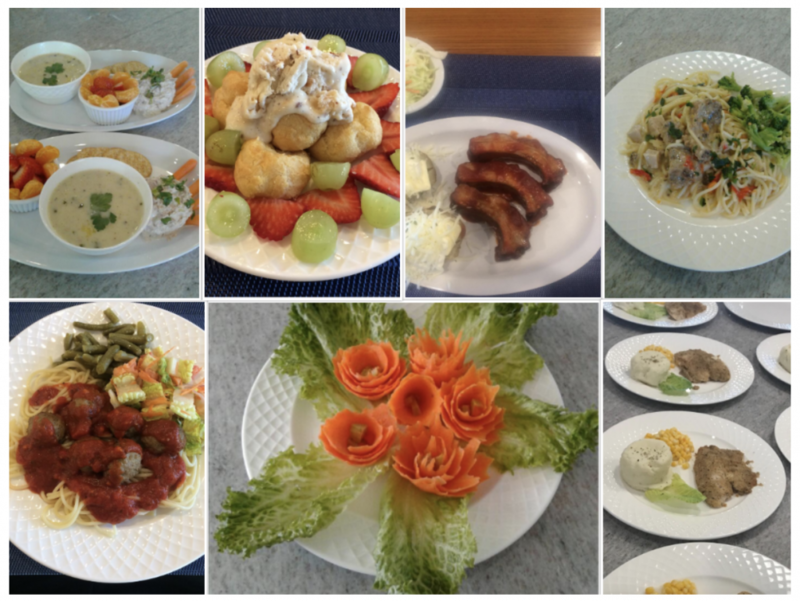 Please check out us out at VistaLiving.net for our latest blog posts and Community pictures! Feel free to call us at (602) 456-1919. Thank you! Vista Living provides the best senior care services in the Phoenix-Scottsdale area. Our experienced and trained staff provides comprehensive care plans called Happy Elder Plans, specifically tailored for each resident to meet their (physical, intellectual, social, and spiritual wellness) interests and care needs. We have the best staff to help your loved one be happy during their time with us, which is our #1 mission. Here is the list of the remaining April events that you can attend if you’re local to Phoenix. Enjoy! “Have Fun and Enjoy Life and People will Seek your Company.” That’s a motto we go by. Hope you are enjoying Spring Time! We are appreciative for our special group of residents and the families we serve. Many of our family members have been caregivers and now they can just be a son and daughter again without the worry and responsibility. Being told that “we got their back” and “we can finally sleep at night” helps validate our purpose. Vista Living Camelback, our second assisted living home, is open. 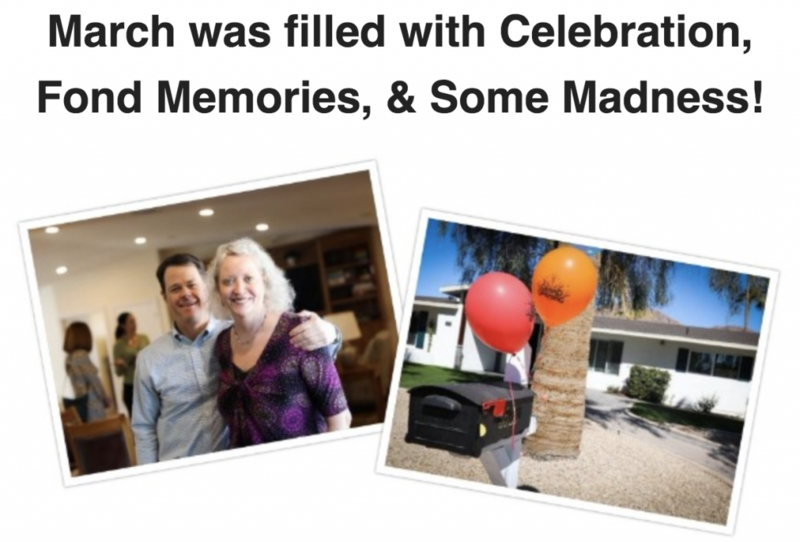 We are excited and grateful that we will be able to serve more families in the Phoenix-Scottsdale area. Vista Living Camelback opened its doors for an open house and invited hungry neighbors and healthcare professionals to a yummy lunch and dessert. There was not a bad seat in the house, as guest mingled with our staff in the living room or on the patio overlooking the elegant Camelback Mountains. Please come back for seconds! Bon Appétit. It’s pronounced “MAK-in-aw” in case you wanted to say it out loud. It’s an island in Michigan and apparently a fan favorite of some of our residents. In fact, one evening at dinner, vacations to this place came up and heads started nodding and stories started flowing. 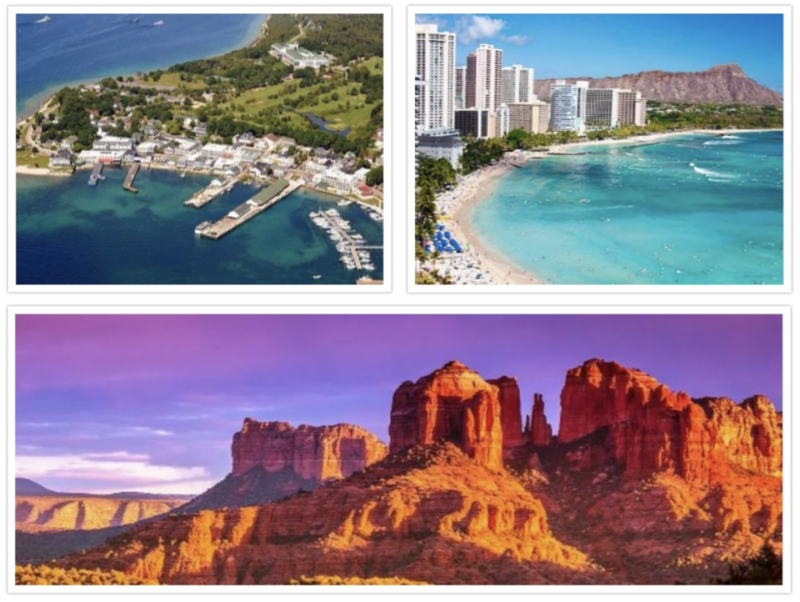 Later, we took a virtual excursion to Mackinac Island via YouTube, and then checked out other vacation hotspots like Sedona and Hawaii. 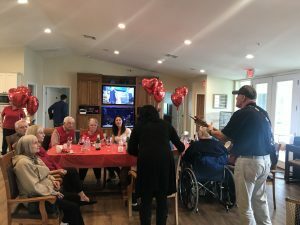 Simultaneously, with the busting of all our March Madness Brackets (it was fun filling them out) – including early round exits of favorites University of Arizona and Michigan State University, the Vista Living family busted out into Dance. Yes, it has been Vista Living Co-Founder Kyle’s lifelong dream to play “Eye of the Tiger” at specifically 2:00 PM on a Friday afternoon at the place he worked at. The place erupted into synchronized dance and Tai Bo-style exercise moves. More “Eye of the Tiger” moments expected and other silliness. Our co-founder Kyle had a great conversation with one of our residents, Bob, about cars from the 1950’s and 1960’s, because he once worked for a car company called Kaiser-Frazer in Detroit. He never was a car enthusiast but when we talked about the discontinued 4-Door Convertibles and why they didn’t work out marketing wise. It made total sense. Read the entire story on the blog! Are you a family member of one of our lovely residents or simply want to let us know how we’re doing? We would greatly appreciate if we can get a review from you. Please email your review to Linda Olson, Director of Community Relations at info@vistaliving.net or call her directly at (623) 256-2430 if you have any questions. There’s no wonder people (and baseball spring training) flock to Arizona during the winter to enjoy the mild weather. Lucky we get to live here! Vista Living Camelback, our second assisted living home, is open. 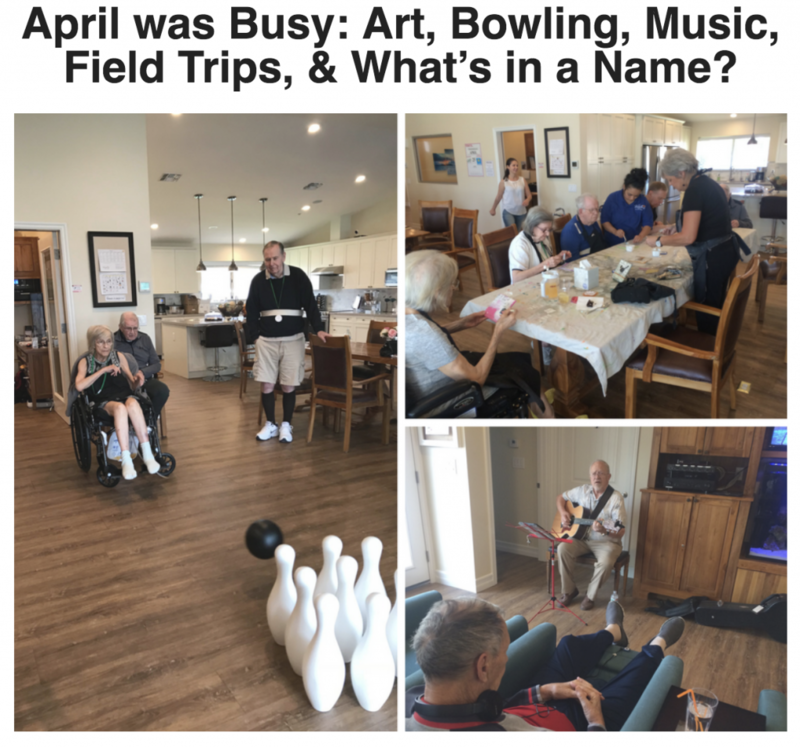 We are excited and grateful that we will be able to serve more families in the Phoenix-Scottsdale area and provide the best assisted living care through our Happy Elder Plan. We had five new residents join us in February and our available suites are filling up. 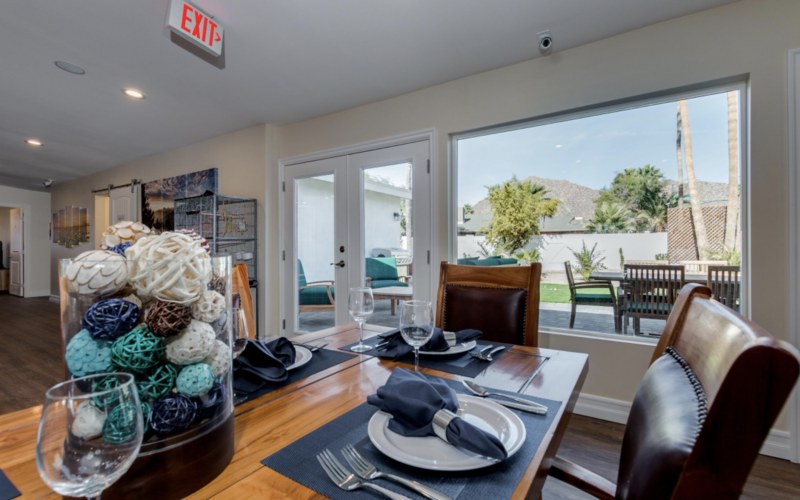 We still have available suites, so if you are interested in touring our communities, please give us call us at (602) 456-1919 or email us at info@vistaliving.net to schedule a tour. February was filled with Love, Olympics, and Fun! Would you be my Valentine? 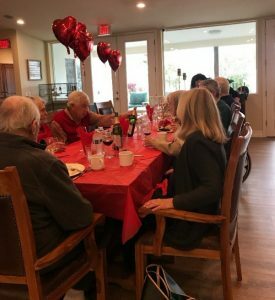 Residents made Valentine’s Day arts and crafts and then enjoyed an afternoon party filled with live music, delicious food, heart-shaped balloons, and cupcakes. Our favorite moments came when residents and their spouses started saying things like “we’ve been married for 56 years”, “50 years”. That’s impressive! 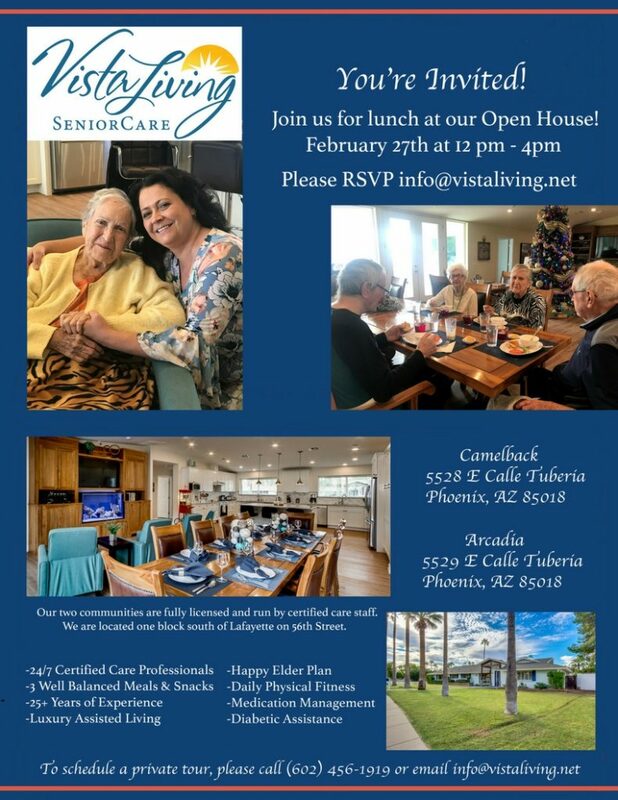 Vista Living Open House Lunch On Feb 27th For Our Newly Opened 2nd Home! We would love for you to join us at the Grand Opening of our second home, Vista Living Camelback! It is a great pleasure to have the opportunity to provide the senior citizen community. Please RSVP by email at info@vistaliving.net. We look forward to seeing you there! Vista Living provides a world-class senior living community for our residents. Every resident has their particular preferences – in group activities, or one-on- one interaction. 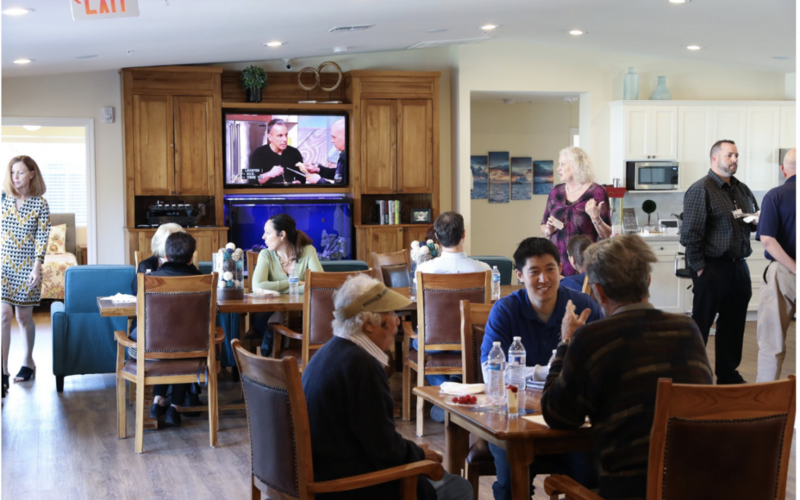 With our high staff to resident ratio, we are able to provide personalized service while maintaining a lively atmosphere in our specially designed common areas. 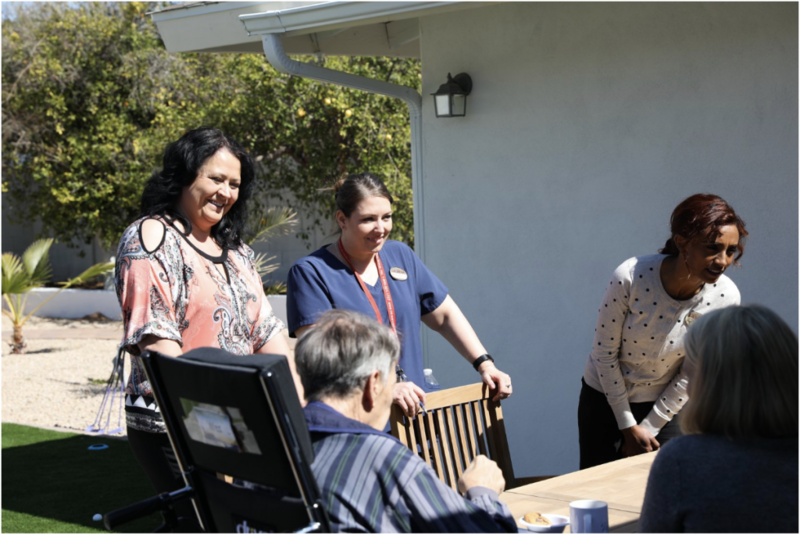 Our residents spend much of their time out of their rooms – eating together, play games, singing, looking out at nature, interacting with the kitchen. We even utilize pet therapy with our pet fish and birds; and we have a landscaped path in the backyard so the garden can be enjoyed.